For the trials in Upper Canada during the War of 1812, see Bloody Assize of 1814. A 19th-century artist's impression of Judge Jeffreys presiding over the "Bloody Assizes". From Winchester the court proceeded through the West Country to Salisbury, Dorchester and on to Taunton, before finishing up at Wells on 23 September. More than 1,400 prisoners were dealt with and although most were sentenced to death, fewer than 300 were hanged or hanged, drawn and quartered. The Taunton Assize took place in the Great Hall of Taunton Castle (now the home of the Museum of Somerset). Of more than 500 prisoners brought before the court on the 18/19 September, 144 were hanged and their remains displayed around the county to ensure people understood the fate of those who rebelled against the king. Some 800–850 men were transported to the West Indies where they were worth more alive than dead as a source of cheap labour (the novel Captain Blood, and the later movies based on it, graphically portray this punishment). Others were imprisoned to await further trial, although many did not live long enough, succumbing to 'Gaol Fever' (typhus), which was rife in the unsanitary conditions common to most English gaols at that time. A woman named Elizabeth Gaunt had the gruesome distinction of being the last woman burnt alive in England for political crimes. Jeffreys returned to London after the Assizes to report to King James, who rewarded him by making him Lord Chancellor (at the age of only 40), 'For the many eminent and faithful services to the Crown'. 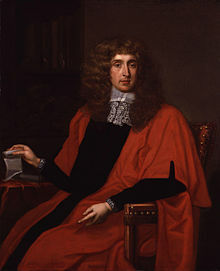 Jeffreys became known as "the hanging judge". After the Glorious Revolution, Jeffreys was incarcerated in the Tower of London, where he died in 1689. His death was probably due to his chronic medical history of kidney and bladder stones leading to an acute infection, kidney failure and possibly toxaemia. ^ a b c d e f Whiles, John (1985). Sedgemoor 1685 (2nd ed.). Chippenham: Picton Publishing. ISBN 978-0-948251-00-9. ^ a b "The Bloody Assize". Somerset County Council. Retrieved 17 December 2015. ^ "The battle of Sedgemoor". Britain Express. Retrieved 21 November 2007. ^ "The Bloody Assize". Somerset County Council. Retrieved 21 October 2012. ^ "Taunton Castle". Everything Exmoor. Retrieved 21 November 2007. ^ a b c "George Jeffreys (1645–1689)". Early Modern Notes. Retrieved 20 February 2008. ^ "The Bloody Assizes". From Watford Gap to Camelot. Retrieved 20 February 2008. ^ Fox was Vice-Chairman of Oxfordshire Quarter Sessions and had been Senior Chancery Master of the Supreme Court. ^ Sir John Fox, The Lady Ivie's Trial, (Oxford University Press, 1929), xlix.